Adams expects to handle more snaps in the slot under new coach Matt LaFleur, Tom Silverstein of the Milwaukee Journal Sentinel reports. "(They) may not want to travel so-and-so with me inside," Adams said Wednesday. "If that will take their No. 1 off me, and I can get some mismatches maybe on the backer or the safety or anybody else, I think that is beneficial." Adams (knee) caught two of four targets for 41 yards in the Pro Bowl on Sunday. Analysis: Adams didn't need much time to recover from the knee injury that caused his Week 17 absence. He'll now head into the offseason healthy, locked in as the far-and-away No. 1 option in a pass-catching corps that could soon get a makeover. The 26-year-old wideout said new head coach Matt LaFleur made a great first impression, giving Adams an easy path to transition into an offense that will move him around more often and place a greater emphasis on crossing routes, per Rob Demovsky of ESPN.com. Adams (knee) is inactive Sunday against Detroit. Adams (knee) is listed as questionable for Sunday's game against the Lions, Michael Cohen of The Athletic reports. Head coach Joe Philbin said Friday morning that the Packers will see how Adams (knee) fares on the practice field Saturday and make a decision on his Week 17 availability after that. Analysis: It's not clear if Adams will get in any work Friday after sitting out the previous two days, but it looks like, regardless, a final call on his Week 17 availability will not be made for at least another day. Adams' status will be updated further after the Packers release their final injury report of the week following Friday's practice. Adams (knee) didn't practice Thursday and instead worked with Green Bay's training staff on the side, Wes Hodkiewicz of the Packers' official site reports. Analysis: The activity is a step up from Wednesday's session, when Adams was seen on a stationary bike in the portion open to the media. It remains to be seen if he'll elevate from DNP to limited, but he seems to be taking a step toward his prediction that he'll be available Sunday versus the Lions. Adams said he missed Wednesday's practice with a knee injury but still expects to play Sunday against the Lions, Rob Demovsky of ESPN.com reports. Analysis: Adams was spotted on a stationary bike during Wednesday's practice, so he at least managed some level of physical activity. The Packers seem determined to finish out their disappointing season on a high note, and it doesn't hurt that Adams is within striking distance of single-season franchise records for catches and receiving yards. A return to practice Thursday and/or Friday would put him on track to suit up Week 17. Adams was held out of practice Wednesday for an undisclosed reason, Josh Tolentino of The Athletic reports. Analysis: Adams was working out on a stationary bikes as a member of a rehab group that included Randall Cobb (concussion), Equanimeous St. Brown (head) and Jimmy Graham (knee/thumb). 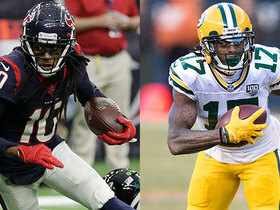 The nature of Adams' issue is unclear and may not be known until the Packers' first Week 17 injury report is released. Adams turned 18 targets into 11 catches for 71 yards and a touchdown in Sunday's 44-38 overtime win over the Jets. Analysis: Adams saved his biggest play for last, ending the game in overtime with a 16-yard touchdown. Aaron Rodgers' favorite receiver heads into a Week 17 meeting with the Lions having already reached career highs across the board with 111 catches for 1,386 yards and 13 touchdowns. 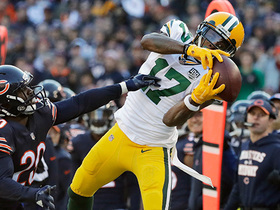 Adams caught eight of 13 passes for 119 yards and a two-point conversion during Sunday's 24-17 loss to Chicago. Adams caught seven of 11 targets for 81 yards and a touchdown in Sunday's 34-20 win over Atlanta. Adams caught eight of 13 targets for 93 yards and a touchdown in Sunday's 20-17 loss to the Cardinals. Analysis: Adams scored his 11th touchdown of the season from 13 yards out in the second quarter. Not only does the 25-year-old wide receiver have double-digit scores in each of the past three campaigns, but Adams also has career highs in catches (85) and yards (1,155) already this season. Owners who have ridden him to fantasy playoff contention are primed to benefit from Adams' favorable Week 14 matchup against the porous Falcons defense. Adams had five catches (eight targets) for 69 yards and a touchdown in Sunday's 24-17 loss to Minnesota. Adams brought in 10 of 12 targets for 166 yards in the Packers' 27-24 loss to the Seahawks on Thursday. Adams caught four of seven targets for 57 yards and two touchdowns during Sunday's 31-12 win over the Dolphins. Adams caught six passes (nine targets) for 40 yards and a touchdown in Sunday's 31-17 loss to the Patriots. Analysis: Adams was unable to extend his streak of 100-plus yard games to four, but a trip to the end zone helped salvage an otherwise quiet night. 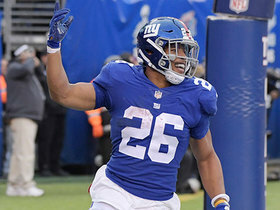 The touchdown brought the 25-year-old's total up to seven on the year, putting him on pace to reach double digits in the category for the third consecutive year. With 730 receiving yards through eight games, Adams is on his way to realizing the bullish fantasy projections made for him this preseason. Miami's 23rd-ranked pass defense is on tap for Week 10. Adams hauled in five of seven targets for 133 yards during Sunday's 29-27 loss to the Rams. Adams caught 10 of 16 targets for 132 yards and two touchdowns in Monday night's 33-30 win over the 49ers. Analysis: Adams was a big-play threat Monday, causing damage to San Francisco's secondary throughout the contest. 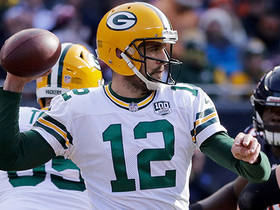 Aaron Rodgers' favorite target came up clutch once before halftime and once before the final whistle, scoring both his touchdowns with under two minutes remaining. Following a Week 7 bye, Adams will face the Rams in Los Angeles. Adams (calf) brought in nine of 12 targets for 140 yards and a touchdown in the Packers' 31-23 loss to the Lions on Sunday. Adams (calf) is active for Sunday's game at Detroit. Analysis: Adams opened Week 5 prep by tweaking his calf at Wednesday's practice, setting off a will-he-or-won't-he be able to play. After spending Thursday as a member of the Packers' rehab group, he was listed as limited on Friday's injury report and practiced in the same capacity Saturday, yet entered game day with a questionable designation. Now that his availability is confirmed, Adams will look to top his best mark (79 receiving yards) from seven previous matchups with the Lions. Adams (calf), who is listed as questionable on the official injury report, is expected to play Sunday against Detroit, according to Adam Schefter of ESPN. Analysis: Adams participated in practice Saturday, so it sounds like he'll play despite missing Thursday's practice and being limited Friday. Still, this report isn't official so fantasy players will want to check his status before kickoff. Adams (calf) remains questionable for Sunday's game against the Lions after participating in Saturday's practice, Jason Wilde of ESPN.com reports. Analysis: Adams' presence at practice is encouraging for his status Sunday, but final confirmation is unlikely to be determined until closer to kickoff. The Packers are already down their No.2 receiver in Randall Cobb (hamstring), while Geronimo Allison (concussion/hamstring) remains a game-time decision as well. Thus, Aaron Rodgers is at risk of being without his top three receivers for the contest. Expect an update on Adams' status once the Packers provide more information. Adams (calf) is listed as questionable for Sunday's game against the Lions. Head coach Mike McCarthy said that Adams (calf) will practice Saturday, Michael Cohen of The Athletic reports. Analysis: McCarthy didn't say whether Adams will get in any work before then, but his comments leave the door open for Adams to play Sunday even if he is sidelined again. Fantasy players planning to include Adams in their Week 5 lineups will want to keep tabs on his status in the coming days, but a final call on his status for Sunday's game against the Lions may not come until shortly before the 1 p.m. EDT kickoff. Adams (calf) was officially listed as a non-participant in Thursday's practice, Tom Silverstein of the Milwaukee Journal Sentinel reports. Coach Mike McCarthy said Adams (calf) will work with the Packers' rehab group during Thursday's practice, Rob Demovsky of ESPN.com reports. Adams was limited at practice Wednesday due to a calf injury, Michael Cohen of The Athletic reports. Adams caught eight of 14 targets for 81 yards in Sunday's 22-0 win over the Bills. Analysis: Adams led his team in targets, catches and receiving yards, but Green Bay's passing game wasn't very stressed in this one given Buffalo's ineptitude on offense. Tight end Jimmy Graham scored the team's lone touchdown through the air while No. 2 wide receiver Geronimo Allison turned 11 targets into 80 yards. 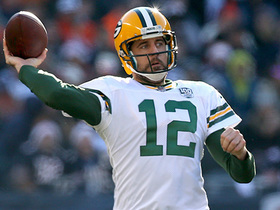 Adams should once again serve as Aaron Rodgers' primary target in the Week 5 divisional clash with the Lions. Adams brought in seven of nine targets for 52 yards and a touchdown in the Packers' 31-17 loss to the Redskins on Sunday. Adams caught eight of 12 targets for 64 yards and a touchdown during Sunday's 29-29 tie with the Vikings. Adams (shoulder) is listed as active Sunday versus the Vikings, Jason Wahlers of the Packers' official site reports. Adams (shoulder) is expected to play Sunday against Minnesota, Ian Rapoport of NFL Network reports. Analysis: Adams is listed as questionable on the official injury report. Adams missed a day of practice early in the week but was able to return on a limited basis. Still, this report isn't official and his status will need to be confirmed before inactives are announced ahead of Sunday's 1 PM ET kickoff. Adams (shoulder) was a limited practice participant Friday and is listed as questionable for Sunday's game against Minnesota, Ryan Wood of the Green Bay Press-Gazette reports. Analysis: Adams started the week as a DNP before upgrading to limited participation the past two days. Both he and Aaron Rodgers (knee) are shaping up as potential game-time decisions ahead of Sunday's 1 PM ET kickoff. Adams did sound optimistic after Thursday's practice, and coach Mike McCarthy mentioned that Rodgers' knee has improved throughout the week. Head coach Mike McCarthy indicated Friday morning that Adams (shoulder) made it through Thursday's practice without issue, but McCarthy still wants to see how Adams fares in Saturday's walkthrough before determining his status for Week 2, Ryan Wood of the Green Bay Press-Gazette reports. Analysis: After sitting out Wednesday's practice, Adams got in a limited session Thursday, saying afterward he felt "great" and was optimistic about playing Sunday against the Vikings. Adams would boost his chances of playing by practicing again Friday, but based on McCarthy's comments, the Packers will wait another day or two before ultimately deciding whether or not Adams will suit up. Adams (shoulder) relayed that he felt "great" after logging a limited practice Thursday and remains hopeful to suit up Sunday against the Vikings, Tom Pelissero of NFL.com reports. Analysis: The Packers still view Adams as day-to-day with the shoulder injury, which he sustained on his 51-yard catch-and-run during Sunday's 24-23 win over the Bears. The wideout improved his odds of suiting up Week 2 against the Vikings by getting back on the practice field Thursday, but his level of involvement in Friday's session will prove more consequential for his eventual status. Packers head coach Mike McCarthy said that Adams (shoulder) would be a limited participant in Thursday's practice, Rob Demovsky of ESPN.com reports. Adams suffered a shoulder injury during Sunday's 24-23 win against the Bears, Michael Cohen of The Athletic reports. Adams is absent from practice Wednesday, Michael Cohen of The Athletic reports. Analysis: Adams played 59 of 60 snaps on offense in Sunday's 24-23 win over the Bears, catching five of eight targets for 88 yards and a touchdown. The workload obviously doesn't hint at any kind of injury, but it's possible he picked something up along the way. Another update will be available later Wednesday when the Packers release their initial injury report for Week 2. 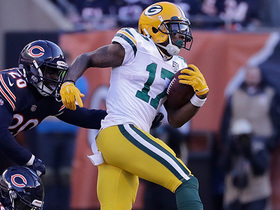 Adams caught five of eight targets for 88 yards and a touchdown during Sunday's 24-23 victory over the Bears. Adams isn't expected to suit up for Friday's preseason contest at Oakland, Mike Garafolo of NFL Network reports. Analysis: No matter whether it's been Aaron Rodgers or Brett Hundley under center, Adams has been running on all cylinders this preseason, turning his three targets into receptions of nine, 27 and 48 yards. There's no need for the Packers to press their luck with Adams or any of the other starters before Week 1, when he'll be acting as Rodgers' No. 1 option in the passing attack. Adams caught one pass for 27 yards in Thursday's preseason game against the Steelers. Analysis: Adams played with quarterback Aaron Rodgers for the first time this preseason and made an impression during his brief time on the field. The two connected for the biggest play on Rodgers' lone drive, as Adams caught a short pass over the middle and chewed up many more yards after that. Adams looks ready for regular-season action, considering he's averaging 28.0 yards on three receptions during preseason play. Adams played just one drive in Thursday's preseason opener against the Titans, but he still managed to catch both of his targets for 57 yards in the 31-17 win. Analysis: Adams did all of his damage on the opening drive with Brett Hundley under center, as star quarterback Aaron Rodgers got the night off. Green Bay's top receiver started his night with a nine-yard reception, then added a 48-yard bomb down the sideline to get to the three-yard line. Adams (hamstring) was back on the field for Monday's OTA session, Wes Hodkiewicz of Packers.com reports. Adams did not participate in Tuesday's OTA session due to a hamstring injury, Rob Demovsky of ESPN.com reports. Analysis: Adams reportedly made his way to the field halfway through practice, but he never participated in the session. The team will likely take precautions with its top wideout early in the offseason to ensure he's ready when the season rolls around. More concern about his status should begin to surface only if the issue begins holding him out into parts of training camp. Adams said Tuesday that he's cleared the NFL's concussion protocol and doesn't have any long-term concerns about his health, Rob Demovsky of ESPN.com reports. Adams (concussion) signed a four-year, $58.75 million contract with the Packers on Friday, Ian Rapoport of NFL Network reports. Adams (concussion) has been ruled out for Sunday's game against the Lions. Adams (concussion) was held out of Thursday's practice, Rob Demovsky of ESPN.com reports. Packers head coach Mike McCarthy said Wednesday that Adams remains in the concussion protocol and wouldn't take part in the team's first practice of the week. Analysis: Considering that Adams is recovering from his second concussion of the season and third in the last two years, it's not looking promising that he'll be back on the field Week 17 against the Lions. He'll need his symptoms to dissipate before he's cleared to take part in practice again, and then receive the green light from an independent neurologist to suit up for the season finale. Those multiple hurdles seem likely to prevent Adams from suiting up for the second time in as many games. Adams (concussion) has been ruled out for Saturday's game against the Vikings, Rob Demovsky of ESPN.com reports. 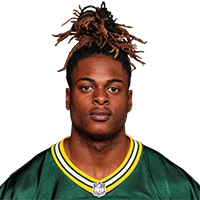 Adams (concussion) was listed as a non-participant on the Packers' injury report Wednesday, Rob Demovsky of ESPN.com reports. Analysis: Although head coach Mike McCarthy mentioned earlier Wednesday that the Packers haven't considered shutting down Adams, there was an expectation the wideout would take a step in the concussion protocol. If Adams did, his inability to practice imperils his odds to suit up Saturday against the Vikings. He'll have one more practice to make his presence felt during Week 16 prep, but in the end an independent neurologist must give Adams clearance before he can return to action. Head coach Mike McCarthy said Wednesday that the Packers haven't talked about shutting down Adams (concussion) for final two games of the season, Ryan Wood of the Green Bay Press-Gazette reports. Packers head coach Mike McCarthy said Tuesday that Adams remains in the NFL's concussion protocol and noted that the receiver "looks good, sounds good." Adams was diagnosed with a concussion and has been ruled out for the remainder of Sunday's game against the Panthers, Rob Demovksy of ESPN.com reports. Adams left Sunday's game at Carolina to be evaluated for a concussion, Pete Dougherty of the Green Bay Press-Gazette reports. Analysis: Immediately after an Aaron Rodgers interception, Adams endured a blindside hit from Panthers linebacker Thomas Davis. The wideout remained on the turf for some time before heading to the sideline, and eventually, the locker room. If he's diagnosed with a concussion, it would mark Adams' second of the season and make for a difficult turnaround for Saturday's showdown with the Vikings. Adams caught 10 of 14 targets for 84 yards and two touchdowns in Sunday's 27-21 overtime win in Cleveland. Adams brought in four of six targets for 42 yards in Sunday's 26-20 overtime victory against the Buccaneers. Adams caught five of nine targets for 82 yards and a touchdown during Sunday's 31-28 loss to the Steelers. Adams caught eight of 10 targets for 126 yards during Sunday's 23-0 loss to the Ravens. Adams reeled in five of eight targets for 90 yards and a touchdown in Sunday's 23-16 win over Chicago. Adams caught seven of 10 targets for 53 yards in Monday night's 30-17 loss to the Lions. Join Deion Sanders on the corner of 21st and Primetime as he delivers his top five performances from the Divisional Round. 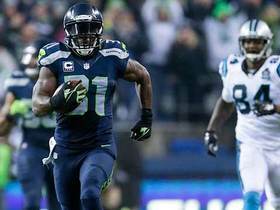 NFL Media's Senior Fantasy Analyst Michael Fabiano gives his top ten fantasy wide receivers for 2019. Green Bay Packers quarterback Aaron Rodgers finds wide receiver Davante Adams for a 16-yard touchdown to win the game in overtime. 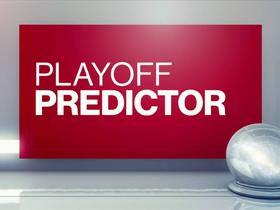 The "NFL Fantasy Live" crew predict several fantasy performances for Week 16. 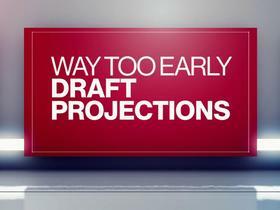 NFL Network's "NFL Fantasy Live" crew reveals their predictions for 2019 NFL fantasy drafts. Green Bay Packers quarterback Aaron Rodgers finds wide receiver Davante Adams for a 23-yard gain. 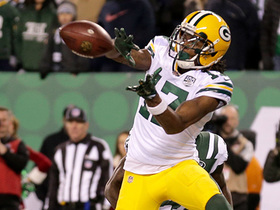 Green Bay Packers quarterback Aaron Rodgers finds wide receiver Davante Adams for a successful two-point conversion. Green Bay Packers quarterback Aaron Rodgers goes deep to wide receiver Davante Adams for a 28-yard gain.